MiR-222 and miR-221 are two highly homologous microRNAs located in tandem on the X chromosome in human, mouse and rat and are highly conserved in vertebrates. Moreover, they have the same seed sequence and it was indicated that miR-222 was co-transcribed in a cluster with miR-221. 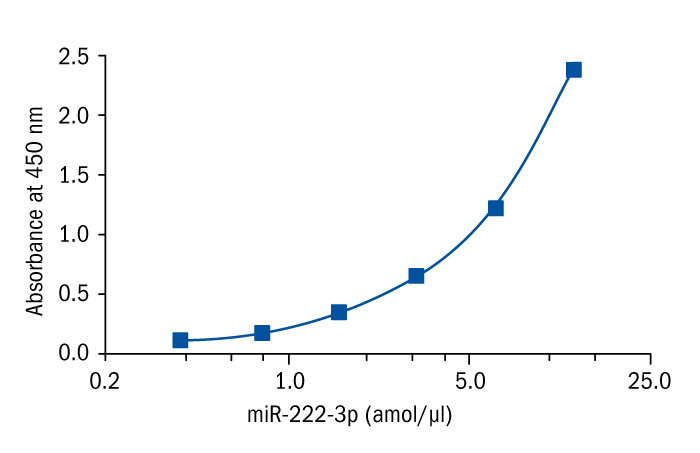 Overexpression of the cluster miR-221/222 has been recently described in several types of human tumors and miR-221/222 are considered to act as oncogenes or tumor suppressors, depending on tumor system. Cell cycle regulator p27Kip1 was identified as a target of miR-221/miR-222. It was shown that in pancreatic cells, p27Kip1 and miR-221/222 expression levels inversely correlated and that miR221/222 overexpression had important consequences on the proliferation rate and the cell cycle phase distribution. These results were then confirmed in glioblastomas, in thyroid papillary carcinomas, in breast cancer, hepatocellular carcinoma, and lung cancer. MiR-222-3p was conﬁrmed to exhibit higher expression level in oral squamous cell carcinoma (OSCC). Up-regulation of miR-222-3p in OSCC was found in the tissue but not in plasma when compared to normal tissues. Abnormal expression of miR-222-3p has been also reported in breast cancer and osteosarcoma (OS). It has been demonstrated that miR-222-3p was upregulated in OS tissues and OS cell lines. Moreover, inhibition of miR-222-3p can suppress OS cell proliferation, colony formation, and invasion in vitro. In addition, several studies indicate that miR-221/222 have a prominent role in acquisition of anti-estrogen resistance and that miR221/222 overexpression is linked to altered response to cancer therapy, either to hormone-based or to conventional chemotherapy. Amini S, Abak A, Estiar MA, Montazeri V, Abhari A, Sakhinia E" Expression Analysis of MicroRNA-222 in Breast Cancer." Clin Lab. 64(4):491-496 (2018). Garofalo M, Quintavalle C, Romano G, Croce CM, and Condorelli G. "miR221/222 in Cancer: Their Role in Tumor Progression and Response to Therapy." Curr Mol Med; 12(1): 27–33 (2012). Galardi S, Mercatelli N, Giorda E, et al. "miR-221 and miR-222 expression affects the proliferation potential of human prostate carcinoma cell lines by targeting p27kip1. " J Biol Chem; 282(32):23716–23724 (2007). Le Sage C, Nagel R, Egan DA, et al. "Regulation of the p27(Kip1) tumor suppressor by miR-221 and miR-222 promotes cancer cell proliferation. " EMBO J.; 26:3699–3708 (2007). Visone R, Russo L, Pallante P, et al. "MicroRNAs (miR)-221 and miR-222, both overexpressed in human thyroid papillary carcinomas, regulate p27Kip1 protein levels and cell cycle. " Endocr Relat Cancer; 14(3):791–798 (2007). Miller TE, Ghoshal K, Ramaswamy B, et al. "MicroRNA-221/222 Confers Tamoxifen Resistance in Breast Cancer by Targeting p27Kip1." J Biol Chem. ; 283(44):29897–29903 (2008). Fu X, Wang Q, Chen J, et al. "Clinical significance of miR-221 and its inverse correlation with p27Kip1 in hepatocellular carcinoma. " Mol Biol Rep.; 38(5):3029–3035 (2011). Garofalo M, Quintavalle C, Di Leva G, et al. "MicroRNA signatures of TRAIL resistance in human non-small cell lung cancer. Oncogene. " 27(27):3845–3855 (2008). Yi-An Chang, et al. "A Three–MicroRNA Signature as a Potential Biomarker for the Early Detection of Oral Cancer." Int. J. Mol. Sci., 19, 758 (2018). Jianping guo, et al. "mir-222-3p promotes osteosarcoma cell migration and invasion through targeting TiMP3." OncoTargets and Therapy ,11:8643–8653 (2018). TylerE.Miller et al. "MicroRNA-221/222 Confers Tamoxifen Resistance in Breast CancerbyTargetingp27Kip1." Journal of biological chemistry, 283:44 (2008).